JOGL provides full access to the APIs in the OpenGL [ 1.0 .. 4.5 ], ES [ 1.0 .. 3.2 ] and EGL [ 1.0 .. 1.5 ] specification as well as nearly all vendor extensions. OpenGL Evolution & JOGL and the JOGL Specification may give you a brief overview. JOGL integrates with the AWT, Swing and SWT widget sets, as well as with custom windowing toolkits using the NativeWindow API. JOGL also provides its own native windowing toolkit, NEWT. Quick Version Info: Current [ NApplet, Webstart ], Next [ NApplet, Webstart ]. Please see the JOGL Tests (next version) and JOGL demos for illustrations of advanced OpenGL techniques now possible with the Java platform. The following are a few examples of projects and products using JOGL. To have your project featured here, please email the project maintainers. Sections: Applications, Utilities, Games and Old. 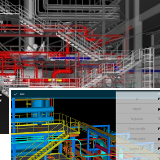 CCTs C3D Interactive is a leading BIM-based construction project control application. The solution helps Construction Managers, owners and contractors to visualize and control their projects, by analyzing key construction information, based on actual progress as well as do visual “look-ahead” based on current progress rates, etc. C3D allows users to link 3D objects to multifaceted data in an object oriented fashion. Data is modeled in classes and hierarchies. C3D is a CAD-neutral vendor platform and can read from several leading authoring tools, supporting a multitude of industry standards. C3D Mobile is available free on Google Play. 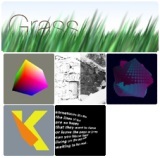 Processing is an open source programming language and environment for people who want to program images, animation, and sound. It is used by students, artists, designers, architects, researchers, and hobbyists for learning, prototyping, and production. Processing is developed by artists and designers as an alternative to proprietary software tools in the same domain. It uses JOGL for its hardware accelerated 3D rendering support. 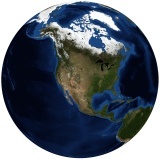 NASA World Wind Java provides a suite of open-source 3-D virtual globe technologies for Java applications, which can be utilized in user applications. Version 2.0 now uses JOGL 2. It provides a rich set of features for displaying and interacting with geographic data and representing a wide range of geometric objects. Online demos are available, as well as an F-16 Flight Simulator from Disti. 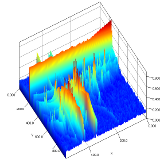 FROG is a fast OpenGL event display tool mainly developed for visualization of data in the field of high energy physics. FROG is mostly used to visualized/animate data from proton/proton collision produced in the CMS experiment at the LHC, CERN, Switzerland. Animations produced by this tools are frequently used to share the progress of the CMS experiment with the media of the world (animations are often visible on scientific website or even on TV). FROG has recently been ported to Java and is now using JOGL and also offers an online demonstration. 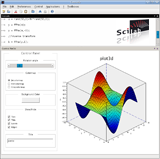 Scilab is a free scientific software package for numerical computations providing a powerful open computing environment for engineering and scientific applications. It has sophisticated data structures, an interpreter and a high level programming language. It also integrates a 2-D and 3-D plotting module designed to visually represent and understand complex data. Fully integrated within the Scilab's Swing UI, the plotting module is based on JOGL, allowing it to take advantage of the OpenGL accelerated graphics. jReality is a Java based, open-source, full-featured 3D scene graph package designed for 3D visualization and specialized in mathematical visualization. It provides several backends, including a JOGL one for Java based OpenGL rendering. JReality is thread-safe, has a flexible shading model based on an attribute-inheritance mechanism in the scene graph, device-independent user interaction and support for 3D audio (JACK). It has a plugin system for assembling custom viewers, an active forum and a growing set of tutorial examples to help developers interested in using jReality to solve their Java 3D problems. For further information please look here. BioJava is an open-source project dedicated to providing a Java framework for processing biological data. It provides analytical and statistical routines, parsers for common file formats and allows the manipulation of sequences and 3D structures. The RCSB Viewers suite of frameworks provides the capability of creating 3-d viewing applications. The libraries are Java based, and use JOGL for 3d rendering. Some visualization tools are RCSB Protein Data Bank (Example) and Epitode Database (Windows only). GeoGebra is free and multi-platform dynamic mathematics software for all levels of education that joins geometry, algebra, tables, graphing, statistics and calculus in one easy-to-use package. It has received several educational software awards in Europe and the USA. GeoGebra 5.0 has experimental 3D support utilizing JOGL. Misc resources: Developer Wiki, SVN Repository. Gephi is a tool for people that have to explore and understand graphs. Like Photoshop but for data, the user interacts with the representation, manipulate the structures, shapes and colors to reveal hidden properties. The goal is to help data analysts to make hypothesis, intuitively discover patterns, isolate structure singularities or faults during data sourcing. It is a complementary tool to traditional statistics, as visual thinking with interactive interfaces is now recognized to facilitate reasoning. This is a software for Exploratory Data Analysis, a paradigm appeared in the Visual Analytics field of research. JaamSim is a free and open source discrete-event simulation software which includes a drag-and-drop user interface, interactive 3D graphics, input and output processing, and model development tools and editors. 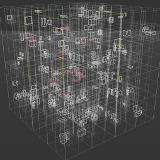 Volume Viewer is an open source renderer for 3D volumetric data. It provides tools for coloring your model, cutting away pieces, and viewing it from any angle. It can cast shadows within the model for extra realism. You can even upload your own volumetric data and view it in real time. 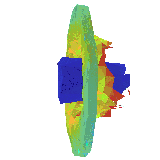 Jzy3d stands for Java Easy 3d, and allows a rapid display of 3d scientific data. User can define z=f(x,y) functions binded to (customizable) colormaps, as well as rendering predefined simple 3d shapes programmaticaly or from csv files. One can moreover add pre/post renderers for adding java2d layers to the 3d scene. Jzy3d provides a simple bridge to AWT, SWT, or Swing, and has already been integrated in Eclipse RCP and Swing applications. The API releases one of the burden of working with OpenGL, 3d polygon ordering and transparency management. OneStone® Pebbles are a new series of calculus visualization tools developed by Bright Ideas Software®. Each 'Pebble' in the series is a stand-alone program designed to illustrate a specific topic in the calculus syllabus. While the topic of each Pebble is different, the experience of using each remains as constant as possible, and features several elements identified as contributing to the development of a deeper understanding of dynamic covariant relationships. The Pebbles use JOGL for their interactive 3D rendering. Try the Curve Families and Surfaces of Revolution examples! Impact is a complete finite element suite including preprocessor, solver and postprocessor which is useable for simulating dynamic events such as car crashes or stamping of metal sheets. The suite allows 3D modelling, solving and viewing of simulation results, all in OpenGL accelerated graphics through the use of JOGL. Insparia was created to help people easily visualize, construct and track information about a 3d environment online. Shape and texture importing as well as a robust renderer will be available in the final commercial version. Insparia uses JOGL to allow the user to construct and interact with their 3d environment in real-time. Please note that Insparia is in alpha testing. Feedback is appreciated. jMonkeyEngine is a game engine made for developers who want to create 3D games following modern technology standards. The framework is programmed entirely in Java aimed at wide accessibility and quick deployment to desktop, web, and mobile platforms. Currently Julien Gouesse develops a JOGL backend for jME3 with support of the jME team. NEWT support is also underway, which will allow jME3 to run on mobile devices as long proper JOGL/OpenGL profile separation is being used. Ardor3D is a professionally oriented, open source, Java based 3D engine brought to you by Ardor Labs. Julien Gouesse started the new JOGL backend development, which is now merged into the official trunk. Java3D is back. It is maintained by Harvey Harrison and initially ported to our current JOGL version by Julien Gouesse. Source available via this git repository and JAR files can be downloaded here. Our forum may help you with your questions. libGDX provides a cross-platform API for game and real-time application development. It's powerful abstractions let you chose how you want to write your game or application, w/o a one size fit all approach. The JOGL backend, a team effort of the JogAmp community, allows libGDX applications to be deployed on desktop and mobile platforms. Source code for this backend is currently available here. LibGDX is released under the Apache 2.0 license. Unlicense is a general purpose public domain (PD) framework created in 2012. The project is self contained and does not use any API from the java virtual machine, providing PD code for character encoding, compression, protocols and image decoders. This qualifies it as a solution for cross-vm applications like JVM and Android. As for rendering this library offer numerous 3D format readers, a custom UI api, and a 3D engine build ontop of JOGL and JOAL. J4K is an an open source Java library that implements a Java binding for the Microsoft's Kinect SDK. It provides access to the video, depth, and skeleton streams of the Kinect using the Java Native Interface (JNI). Furthermore, utilities are provided to convert the packed depth frames, skeleton frames, and video frames received by a Kinect sensor into easy-to-use Java objects, as well as methods to save the data in open file formats such as VRML. JOGL may be used to visualize the kinect data as 3D textured surfaces in OpenGL (Demo Video). Source code is available in this git repository. JOGL is one renderer backend besides others. GLG2D is a Graphics2D implementation that uses OpenGL to implement basic Java2D drawing functionality. We currently use the fixed function pipeline, with the GL2 profile for most functionality. But a shader implementation is in the pipeline (so to speak). See implementation status for which features are fully implemented. jspatial implements a set of spatial data structures. It features Quadtree and Octtree implementations, including efficient area and raycast queries. It has numerous working examples and full documentation including tutorials and JavaDoc. It includes a test suite with 97% automated unit test coverage. It is platform and rendering-system independent, but uses JOGL for the included example Octtree viewer. The code is under the extremely liberal ISC (BSD-like) license. dyn4j is a 100% Java 2D collision detection and physics engine. Designed to be fast, stable, extensible, and easy to use. dyn4j is free for use in commercial and non-commercial applications and licensed under the New BSD License. The project comprises hundreds of JUnit test cases, Sandbox: a GUI test application, two example applications (ExampleGraphics2D and ExampleJOGL), Javadocs, wiki, forum, and more! GL Studio is an object oriented rapid application development tool that allows a user to graphically combine photographs, 3D models and behavior logic to create advanced 2D and 3D human machine interfaces. GL Studio generates Java or C++ source code which can then be integrated into the user’s application as a user interface. Java code using JOGL can be exported. An F-16 Flight Simulator using NASA World Wind is demonstrated. MyHMI is a Java based object oriented software framework for industrial graphical user interfaces development. 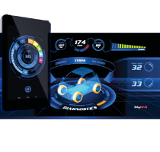 It enables creation of visually adjustable interfaces for embedded systems, independently of underlying OS or hardware platform, communication or data processing mechanisms. An expressive and comprehensive 3D visualization MyHMI provides, is based on a low level OpenGL and OpenGL ES standards and a higher interlayer based on JOGL enabling multiplatform compatibility. Ticket to Ride and Memoir '44 are boardgames published by Days of Wonder. They also make digital versions of these games since 2006. These are available on all desktops computers (Windows, MacOS and Linux), thanks to the use of Java and JOGL. This has proven to be the best solution to create the same gaming experience on all desktop computers with a single code base. The games are available on Steam. Days of Wonder is currently porting their engine to JOGL2, allowing the inclusion of Android devices. Everplanes is a game of exploration, building, survival and strategy. It introduces new gameplay, resources and challenges in the updates. Each time the game is started, it automatically downloads the latest updates. The game includes a built-in server for LAN or Internet play. You can run an open server, or configure various levels of access control. Everplanes features a built-in server browser and also includes global chat facility. Everplanes is available for Mac OS X 10.4+, Windows XP/Vista/7 and Linux. 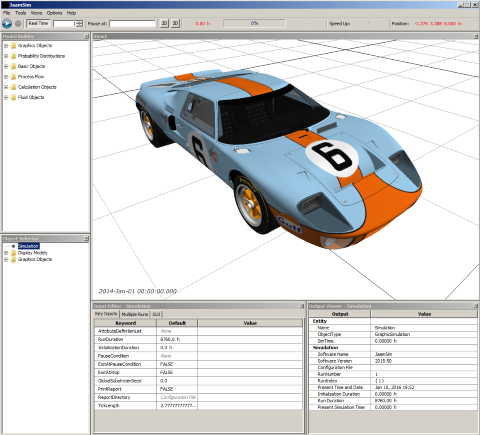 The Elflight Engine is a games engine designed for the web. It supports hardware accelerated 3D games and applications in a web browser, with the ability to import assets from major 3D packages such as Maya and 3D Studio. The focus of the engine's architecture is minimal startup time, fast streaming, local caching and collaborative real-time editing. The Elflight Engine is multi-user and so lends itself to the development of virtual worlds and MMOs. 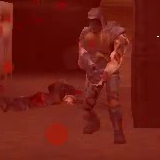 Jake2 is a port of id Software's GPL'd Quake II engine from C to Java done by bytonic software. Jake2 has been ported to the current JOGL version for desktop OpenGL and mobile OpenGL ES1 and ES2 use including dropping AWT in favor of NEWT. You can run the game online as an NApplet or via Webstart on all of JOGL's supported platforms. You can find the current source code in this git repository. chronotext is a series of visual design experiments involving animated text and 3D objects and surfaces. Several examples can be run on-line via Java Web Start. See the latest experiments of mapping text on to real 3D surfaces. With STRAP you can align your proteins by sequence and 3D-structure. STRAP simultaneously displays 3d-structures, amino acid sequence alignment and nucleotide sequences. It has powerful annotation features. Art of Illusion is a free, open source 3D modelling and rendering studio. Many of its capabilities rival those found in commercial programs. Some of the highlights include subdivision surface based modelling tools, skeleton based animation, and a graphical language for designing procedural textures and materials. It uses JOGL for real-time OpenGL rendering in its modeling views. Vehicle Dynamics Engine Demo is a Java Web Start demonstration of a 3D physics engine developed by Insight Machines. The engine is designed especially for car games. The demo uses JOGL and employs such techniques like shadow casting using the stencil buffer. Sculpteo offers a 3D printing service, fast and available for everyone. Starting from a 3D design, Sculpteo makes a specific object : interior decoration, characters, robots, miniatures, models, mechanic objects... FengGUI is a graphical user interface (GUI) application programming interface (API) based on OpenGL. FengGUI provides all typical GUI components like buttons, sliders, trees, text areas, frames, tabs, etc. which are required to build a complete GUI system. Since it is based on OpenGL, FengGUI fits well in multimedia and game environments. The Fusion Framework enables Swing components to be extended with 3D content via JOGL. In general the 3D content will show up in layers on top of the corresponding Swing component. The system provides a simple scenegraph, Swing-like mouse interaction, and low-level animation support, as well as GLSL shaders and .obj file loading. The demo page contains several Java Web Start applications.